Our client was in the process of installing a large array of photovoltaic panels onto a new residential sub-division and questions arose about the structural performance of the panel frames and their method of attachment to the roof. 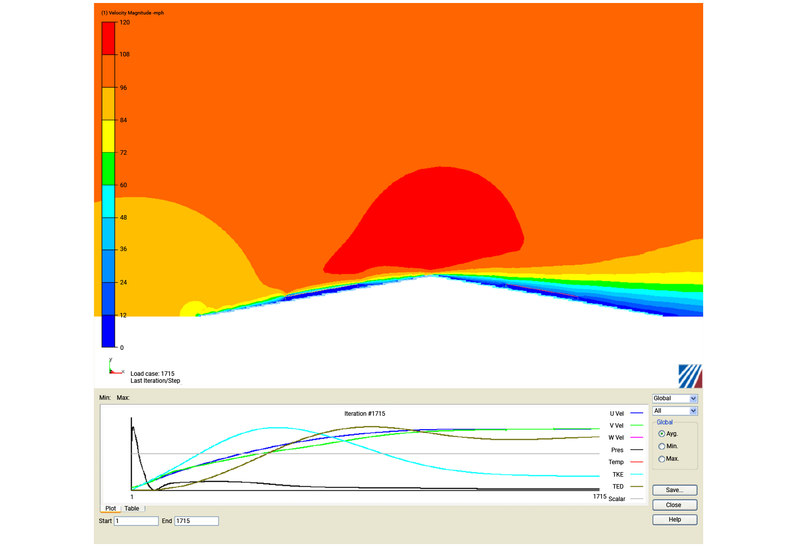 Prior to the FEA analysis of the frames, a CFD simulation was done to accurately bracket the wind loads on the panel. To increase our confidence in the CFD predictions, a parametric study was done with the panel at different angles and the different wind speeds up to 100 MPH. The PV system consists of 4 modules that are aligned edge-to-edge to create an overall panel having dimensions of 130” x 62” x 2”. The panel is mounted to the roof with 8 mounting brackets. The mounting brackets are four inches wide and are attached along the bottom and top edges of the PV Panel. Given this geometry, the panel was idealized as a 2-D CFD model allowing us to greatly increase the throughput of analyses. Although this assumption simplifies the physics, as CFD consultants it is our responsibility to ensure through our experience that such assumptions are reasonable. To back up this approach hand calculations were performed following the wind load provisions within ASCE 7-02 and shown to generally agree with the CFD results. However, the code lacks the ability to capture the localized effects of the panel edges and doesn’t negate the utility of the parametric CFD wind study. For this CFD consulting project, the PV Panel was mounted mid-way up on an inclined roof having inclined slopes of 10, 18 and 30 degrees. This allowed us to capture the range of roof slopes that would be present in the residential housing unit. As for the effects of adjacent buildings, those could be ignored since the highest wind forces would occur on the units located around the peripheral of the housing complex. A total of nine conditions were investigated and their configurations were summarized within the engineering report delivered to the client. One of the key CFD result from this investigation was that the panels should be mounted such that air can flow under the panels. It was determined that the uplift on the panels can increase by a factor of 3x if the panel are blocked to prevent air from flowing underneath. 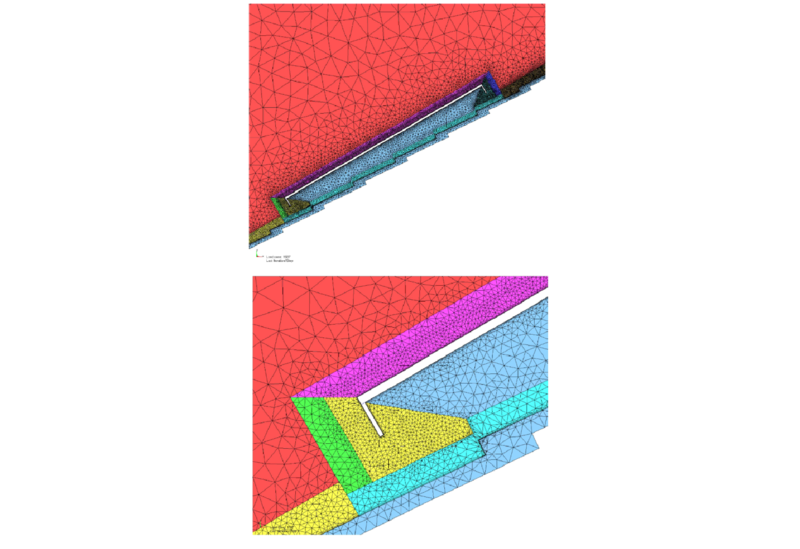 This CFD simulation was leveraged going forward to provide conservative loads for the FEA modeling of the panel supports. The utility of this work is that it allowed the client to rest easily that the wind loads would not exceed those more conservatively predicted by ASCE 7-02 and that nothing unexpected might occur during a high wind event. Additionally a transient CFD wind gust analysis was done and it was determined that vortex shedding on the eave of the roof would not generate additional wind loads on the photovoltaic panel. 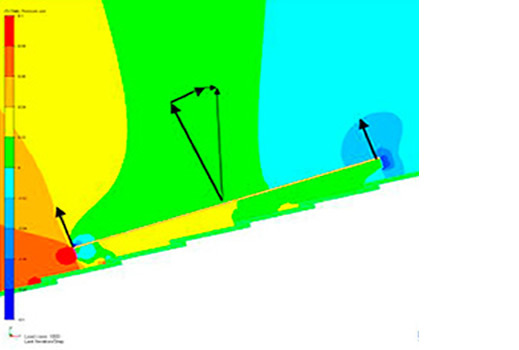 Figure 2: CFD simulations to predict pressure loading over bodies are very sensitive to boundary conditions. The image shows the extent of the far-field boundaries that were used to ensure a converged solution. It should be noted that this mesh density was arrived through several convergence iterations until the force predictions had leveled out. This work was tied into the CFD boundary conditions study. The convergence monitor indicates that the solution has reached a steady-state basis and provides one assurance that the CFD results can be trusted. At Predictive Engineering, we are longtime experts in LS-DYNA and can help guide you through the software acquisition process, installation, support and user training.